Carnival celebrations in Mexico are some of the most exuberant you'll find anywhere. Carnival is a colorful and uninhibited celebration, an opportunity to express joy, have fun, eat and drink in excess, and party until dawn. It is celebrated in many places in the Catholic world: in preparation for the solemnity of Lent, the unrestrained celebration allows people to get all the craziness out of their systems so they'll be ready for the sobriety and temperance that characterizes the Lenten season. 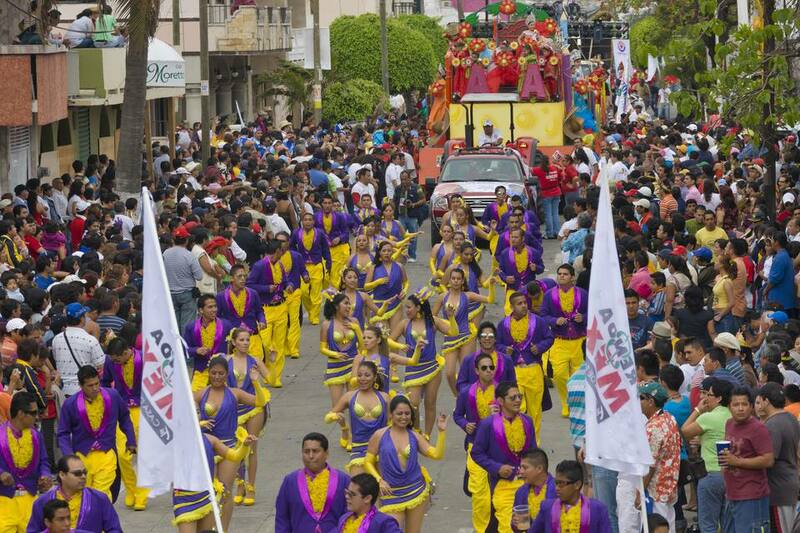 Carnival in Mazatlan is said to be the third largest celebration worldwide, following Rio de Janeiro and New Orleans. Carnival is held during the week prior to Ash Wednesday, which is the first day of Lent, a period of forty days before Easter. Beginning on the Friday before Ash Wednesday, the celebrations reach a climax on the following Tuesday, known in many locations as "Mardi Gras." The day's name in French which literally means Fat Tuesday, in Mexico, it is called Martes de Carnaval. The biggest carnival celebrations take place in the port cities of Veracruz and Mazatlán and are expressions of the festive and welcoming culture in these port cities, but other celebrations take place throughout the country, each with their own particular flavor. In indigenous communities, Carnival often takes on a completely different meaning and the festivities may include a combination of Christian and pre-Hispanic traditions. Learn more about Mexico's varied celebrations and where to celebrate carnival. Though celebrations vary to a certain degree in each destination, the biggest Carnivals usually begin with the Quema del Mal Humor, the "Burning of Bad Mood." This is usually an effigy of an unpopular political figure and the burning symbolically represents the people leaving behind everyday worries and concerns so that the merriment can begin. This event kicks off the fun which also usually includes the crowning of a Carnival Queen, and King--sometimes referred to as the Rey Feo, or "Ugly King" (in Mazatlan he's officially called el Rey de la Alegria, the "King of Joy") who will preside over the festivities. There are extravagant parades with elaborately decorated floats and revelers wearing creative costumes, concerts, and other live entertainment, dances, fireworks, and carnival rides and games. The last day of the Carnival festivities is Mardi Gras, "Fat Tuesday," or Martes de Carnival, when another effigy is burned, this one called "Juan Carnival," which represents all the wanton revelry associated with Carnival. This marks the end of the debauchery and return to temperance. On Ash Wednesday folks will go to church to receive ashes and the abstinence of Lent will begin. As we've discussed, many of Mexico's destinations celebrate carnival in the way that you might expect, with parades, costumes, queens, and floats, but some other places have very different celebrations, showing a blend of indigenous traditions and beliefs with the standard celebrations. Carnival celebrations originally came to Mexico along with the Spaniards and their religious beliefs and customs in the 16th century. Some of the traditions around the European celebration of carnival were adapted to fit with indigenous festivals and calendar cycle, such as the idea of five "lost days" (the solar calendar cycle of Mesoamerica consisted of 18 months of 20 days plus an additional five days which did not belong to a particular month and were considered inauspicious). It seems that in some locations the celebration of carnival was equated with those lost days when the usual rules do not apply. Some of these special carnivals will include dancing with masks, men dressing as women, reenactments of battles and other important events from the time of the conquest.